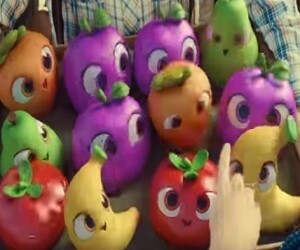 The latest Farm Heroes ad shows how a super plum saves the day at a local Country Fair. The hero is a young woman who, after matching four plums in the crate held by a peasant, creates the Super Plum, which serves as a safety net for a man in danger. The latter, who was about to fall from a Ferris Wheel, jumps on the Super Plum and then arrives in the arms of the young woman. “Bigger is better. All-New Farm Heroes Super Saga. Download now”, says the voiceover at the end. The song playing in the background is “Tutti Frutti” by Little Richard.